5 Proven Funny Business Cartoons That Have Been Used in Major Business Publications. And you can use them for only $20 a piece in your own powerpoint, presentation, e-mail campaign, e-newsletter, blog or company social media page. Click to contact me if you have any interest in using them in hard-copy materials, such as newsletters, magazines, brochures, etc. This ironic alligator/businessman briefcase cartoon was first used by Reader's Digest Magazine. Although not a business publication, Reader's Digest often uses business cartoons in the work related areas of the magazine. This cartoon might work for a business presentation about workplace fashion or I often thought it would be ideal for an animal rights organization. Click on the cartoon to add to cart, pay for and download it for your purposes. This consulting fee cartoon has appeared in Barron's. 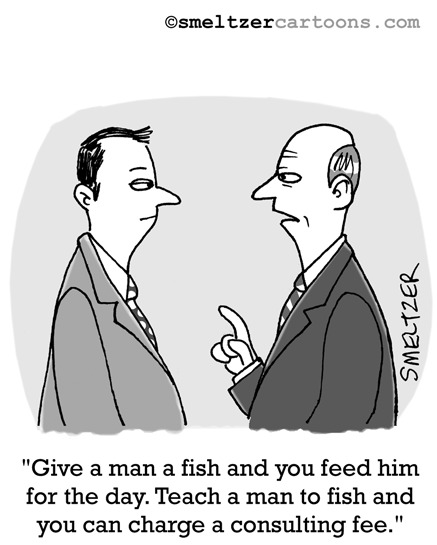 It's a play on the old "Give a man a fish.." adage. I think this cartoon could work in a lot of different business situations. Click on the cartoon to add to cart, pay for and download it for your purposes. Here's another cartoon that I was happy to have published in the Wall Street Journal. It's a cartoon that's near and dear to my heart, because I do a lot of penciling in. Although I don't have a cool view of the skyline out of my office window like this cartoon does. Click on the cartoon and get the ball rolling to use it in your presentation, e-mail, blog, etc. Do you ever get the feeling that you might have less of a hard time getting to talk on the phone to someone if your name was Warren Buffet or Paul McCartney? I think you're right. And our receptionist above is proving the point. This cartoon showed up in a really cool business magazine called Worthwhile. Unfortunately, they went out of business some years back. Click the cartoon to add to cart. Here's a cartoon that might be good in a real estate presentation, e-mail, blog, e-newsletter, etc. It could also work for estate planning lawyers, retirement firms or stock brokers. Just click on the cartoon to start using it for your electronic media purposes. Contact me to use in printed materials such magazines, newsletters, greeting cards, brochures or what have you. WANT TO SEE MORE OF MY BUSINESS CARTOONS? JUST CLICK HERE! Well here I am, a day late and a doggy short. Is that the old phrase? No, I didn't think so, but YOU try to come up with an opening line for a blog post. Anyways, in honor of our illustrious furry friends, I've decided to post one of my dog cartoons, hopefully for your enjoyment. Feel free to show it to Fido or Fidette. You'll know they like it if you get right up in their face and start saying their name while talking in baby talk. If they start licking your face, they like the cartoon. Unless you just ate a bologna sandwich, which could mean they are motivated by something else entirely. But show it to them anyway. He or she might enjoy seeing this business cartoon featuring a K9 in a starring role. Do you know what it must take for a cartoon dog like this to work his or her way up the corporate ladder to finally become a CED (Chief Executive Dog)? Probably they would need to start off in the mailroom, trying to hold back from their natural impulse of barking at the mail carrier. That must be r-r-r-rough. Maybe next, they would be promoted to a customer service phone job, where they would salivate every time the phone rang. Or possibly they work their way up through a position in Human Resources, which when you think about the name of the department, is kind of biased towards humans and not doggies. Well this dog certainly is enjoying his place at the head of the board room table and is really tickled when one of the board members brings up the idea of outsourcing. Check out the cartoon and you'll see why. Thanks and happy National Dog Day, yesterday! If you would like to use this cartoon in your powerpoint, presentation, email or other electronic media, just click on the cartoon and you'll find yourself on the cartoon page where you can download it for $20. Want to use it in print form for newsletters, magazines or books? Click CONTACT at the top of the page and we'll figure out a fair price for your specific needs. Grab The Popcorn, It's Time For A Business Cartoon Video. Here it is. Back by popular demand! My Smeltzer Cartoons "Business Cartoon Slideshow Presentation" on Youtube! You're Welcome! Actually, I'm embedding this video on my new fancy-schmancy blog, because I've redesigned my website and my old website page that was home to the video before, is no longer there. Go ahead and check- I'll wait. Hmmmmmm...hmmmmmm...hmmmmmm (fingers tapping on the desk) Hmmmmmmm....hmmmm...hmmm (whistling theme to The Munsters). Okay, are you back? See, I told you it wasn't there. It's here and it's available for your viewing pleasure. All one minute and 19 seconds of it. So, grab the popcorn and those snow cap candy deals and sit back as you lose yourself in the whimsical world of Steve Smeltzer's cast of wise-crackin' business characters. (I wonder if anybody's actually reading this?) You want cartoons of business people giving presentations? You got it! You want cartoons about non-productive employees? You got it! You want anthropomorphic animals in business suits? You got it? You want.....well you get the idea. One mouse click and you'll see the funniest business cartoons you'll see at that same exact moment, anywhere else. At Smeltzer Cartoons, I take your busy schedule into consideration and have painstakingly designed the video to play with one mouse click. (Or maybe that was Youtube, that did that...I'll check into that). Irregardlessly regardless, you'll notice that the cartoons seamlessly move from one to the other and all you need to do is sit back and read the captions underneath the funny pictures. Those of you who have not taken the Evelyn Wood Speed Reading Course may want to make use of the pause button on the lower left of the video player. Click on the cartoon and it will take you to a shopping cart, where you can pay by credit card. It's safe and simple. And it's only $20 to download. If you want to use it print media (magazine, newsletter, book, greeting card, etc. ), contact me here and we'll work out a price.